I’m glad some of you liked the goats cheese starter we had on the valentines meal. Goats cheese has to be one of my favourites, though before visiting the Dordogne back in 2011 I hadn’t really tried it much so I’m a relatively new fan. 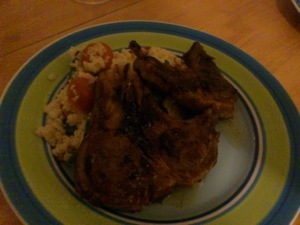 The main course is sticky fig Lamb cutlets with a warm green bean and couscous salad, both of which are dead easy to make. With any meal you’re making for a celebration you want it to be quick and easy to cook with minimal fuss. Lets face it do you want to be in the kitchen worrying over the stove or enjoying time with your loved one? I think the Lamb cutlets would work equally well as a Sunday lunch with a medley of roast parsnips, carrots and sweet potatoes. Yum! I got this recipe (as with the starter and many others) from bbc good food, often my kitchen helper. Heat a frying pan and bring a pan of water to the boil. Boil up a kettle and put the couscous in a bowl, pour over 100ml boiling water from the kettle, cover and set aside for about 10 minutes. Meanwhile, rub a little of the oil and some fig conserve onto each chop. Cook the green beans in the boiling water for 4 mins, then drain. 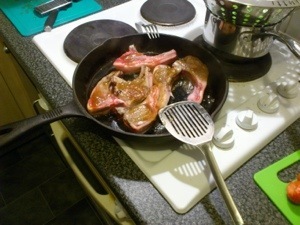 Once the frying pan is hot, cook the lamb for around 3 mins each side, basting with the fig conserve as they cook. Add the balsamic vinegar in the final minute of cooking. Pop the lamb on a plate and leave to rest. Bubble any remaining juices in the pan until sticky, the reserve for later. Mix the couscous with a fork to fluff it up, add the drained beans, some finely sliced red onion, halved tomatoes, lemon zest and juice, the torn mint and the remaining oil. Season and mix well. 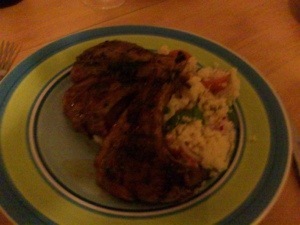 Divide the salad between 2 plates and top with the Lamb cutlets. Drizzle over the remaining sticky juices from the pan and scatter over a few whole mint leaves. I will share the dessert in my next post, it was a delish strawberry Eton mess. It’sbeen a nice weekend over Hanas birthday this weekend and I will have to share some pictures from that soon too!